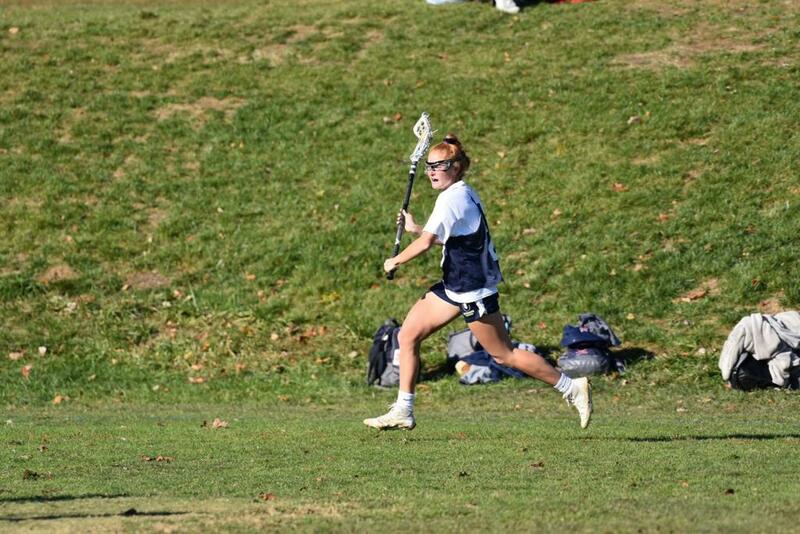 Congratulations to Ultimate PA 2020 player Olivia Pace, who has committed to play lacrosse and study at St. Joseph’s University! Pace hopes to study interdisciplinary health services at SJU and is interested in possibly pursuing a career in nursing. “Olivia is a strong, tough, smart player that is fierce on the field. She has the ability to take what she wants and commands a presence. I’m excited to see what she will do at the next level,” explained Ultimate Lacrosse Head Coach Michele DeJuliis. “I am very excited to play at SJU for Coach Kahoe, Coach Dawson, and Coach Lynch. The atmosphere of the team was very welcoming which I loved right away. I am so excited to be part of a program with a talented coaching staff and hardworking team that keeps improving with each season. 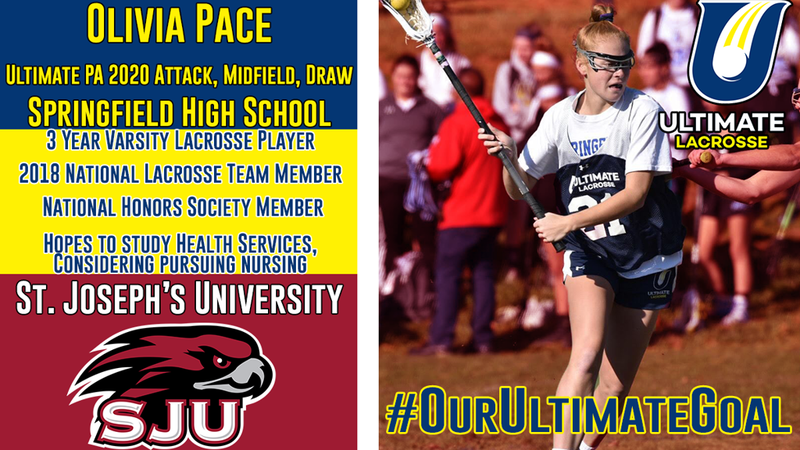 SJU is a great fit athletically and academically and it is the perfect place for me to continue my lacrosse career and education,” explained Pace. Olivia has been playing lacrosse since 4th grade. At Springfield High School she is a two sport varsity athlete, bringing relentless energy to both the soccer and lacrosse teams. In her two varsity lacrosse seasons with Springfield High School Olivia is known for her quick shot and impressive field vision. Olivia has been called on for draw controls and is equally successful on the re-defend. She has helped lead Springfield to some big games: two district finals, a state semi-final, and a state championship game. Outside of Ultimate and high school commitments Olivia also played on the 2018 National Lacrosse Team. Olivia is a member of the National Honor Society and volunteers for Steve Stefani Dance Marathon to raise money for pediatric cancer research. A force to be reckoned with in the Atlantic 10 Conference (which features Davidson, Duquesne, George Mason, George Washington, La Salle, St. Bonaventure Richmond, UMass, and VCU), St. Joseph’s has gone 21-6 in A-10 play over the past three seasons, a stint where the Hawks have made it into the A-10 tournament three consecutive times. Head Coach Kahoe, who was a five-time National Champion, three time All-American, and two-time NCAA Goalkeeper of the Year at the University of Maryland, has made an immediate impact on the Hawks after taking over as Head Coach in 2014. Under Coach Kahoe the Hawks have set program records for most wins in a season two seasons in a row (11 in 2017, 12 in 2018) and made it all the way to the A-10 Tournament semi-finals in 2018. Head Coach Kahoe’s assistants are equally talented, as Assistant Coach Colleen Dawson was a NCAA champion at Maryland and Assistant Coach Becky Lynch was a 2012 Tewaaraton Award Finalist. The SJU roster currently features three Ultimate grads, Fran Donato, Riley Delaney, and Sophia Kolkka. Senior Donato is currently SJU’s leader in assists and points. Congratulations on your commitment to SJU, Olivia!